I don't know! I use a random number generator, but I think fate has a hand in it. 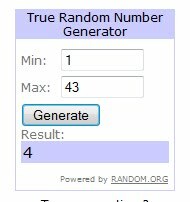 When I used the random number generator to choose the winner for my Hotel Chocolat prize, Janice won it. Janice who was on a diet and really didn't want chocolate and this time I use the random number generator and once again I am left with an unlikely winner. Let me explain. Congratulations Shaheen. You have won a very cute apron, so now it is time to get into the habit of wearing one. Ha ha, very funny Jac. I did manage to 'test' the chocolate by the way, but my husband ate most of it. Congrats to Shaheen on winning the Cute Apron. Contratulations to Shaheen, she'll look lovely in that apron. Whenever I don't wear an apron, I wish I had. Next on my list of things to do is to put up a hook for our aprons - I reckon if they are to hand, I will wear it more often. Congrats to shaleen, I'm sure you'll remember to wear this one. Too funny! Congrats to Shaleen! Ehehe..this is funny! Well done Shaleen!! Yes it is funny. As soon as I realised I had won an apron, I ran to my husband like an excitable child and said guess what i won?! An apron! 'Of course', but it may wait till we move home and that way I will hang it in the kitchen and appreciate it moreso as a accidental kitchen-warming present. I promise when I do move home, I will post a photograph of it. Thank you all for your heartwarming comments, that made me chuckle out loud.